Space Invaders is a video game icon: even people who don't play video games are likely to recognise the bitmap images of the Invaders thanks to Taito's persistence in keeping the brand name alive via product licensing, video game sequels and home console ports. 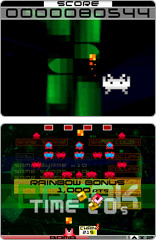 The celebration of the 30th anniversary of Space Invaders saw the release of a new WiiWare game and Space Invaders Extreme on the DS; a big enough hit to warrant a sequel in the last quarter of 2009: Space Invaders Extreme 2. Space Invaders Extreme Z is essentially a condensed version of Extreme 2 - there's no multiplayer and no Wi-Fi connection or online rankings. Instead you get a single-player version of the game, including both the Score Attack and Timed modes, and local rankings for the top ten scores in both modes at Normal and Extreme difficulty settings. 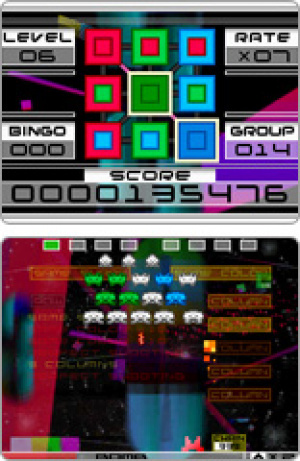 Extreme Z makes good use of both DSi screens: the top one displays the "bingo" screen - a key component in this sequel - whilst the core game action takes place in the bottom screen. The invaders come in smaller numbers, more varied patterns and a greater variety of colours than the seminal original. By shooting invaders in groups, bonus items and power-ups are released in the form of coloured boxes spinning down towards your ship. Shooting blue, green or red invaders in groups of four releases a colour-coded power-up: blue continuous beam weapon, green multi-shot or red bomb shot, respectively. 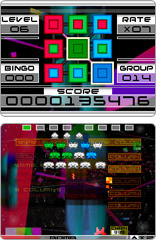 Shooting invaders in groups according to colour also fills in squares on the nine-panel Bingo screen; building up chains and eventually triggering bonus "Rounds" in which different invader patterns appear in the top screen for a limited time. If you destroy all the invaders in the top panel you get a further bonus round called "Fever Time" in which waves of motherships zip through the top screen that you can shoot for bonus points. Whilst both of these events are happening, the bottom screen continues to feature waves of invaders that interfere with your shots. During Fever Time the invaders in the lower screen turn gold and release bonus items when shot so you can really rack up the points. By itself that would make for a pretty good game, but what makes Space Invaders Extreme Z so excellent is the quality of the presentation and the audio. The soundtrack is a pumping electronic beat enhanced by your shots and the invader explosions, turning it into a rhythm-action game as you find yourself timing your firing to the beat. During Fever Time an announcer will chime in with great lines like "that's gotta feel good!" - and it does, actually! The graphics are crisp with vibrant colours for the invaders and complex 3D shapes moving in time to the music in the background. The whole experience is like a Space Invaders rave in your hands. The timed mode which sees you trying to destroy 50 waves of invaders in the shortest time possible is the icing on the cake. For 500 Points importers really don't need to think twice, but other than convenience there's probably not much of a draw if you already have Space Invaders Extreme 2. As a longtime fan of Space Invaders, I'd love to have a version on my DSi. But since I just bought Extreme 2 I think I'll pass if they bring this to the US, at least for now. Wow, this is great news! A DSiwzre version of my fave DS game. Hmm, whenever this comes out here in NA I'll have to pick it up and try it out ... and maybe pick up the full version for really cheap! I have Space Invaders Extreme 1 and 2 which are banging and clearly the best shooters on the ds imho. Get this if you don't have Space Inv Extreme 2, you'd be mad not too! I have tried the psp demo for Space Invaders Extreme 1 and it is really fun. The only thing that has prevented me from buying a copy of either 1 or 2 is the hope that Z will hit Europe soon. For this kind of game I would rather have a downloaded version for quick blasts. A physical copy I wouldn't carry around with my DSi so much. @ Sean ... does it have a beginner's/easy mode (my lad plays that mode)? Yes there is a Beginner difficulty, but there's no leaderboards for it.